Windows 95 is available on just about anything these days. We’ve seen it running on iPhone, iPad, Android Wear, and even Apple Watch. Look hard enough and you’ll probably find a Windows 95 port for your smart fridge. But very little effort is required to revisit Windows 95 on Mac, Windows, or Linux. 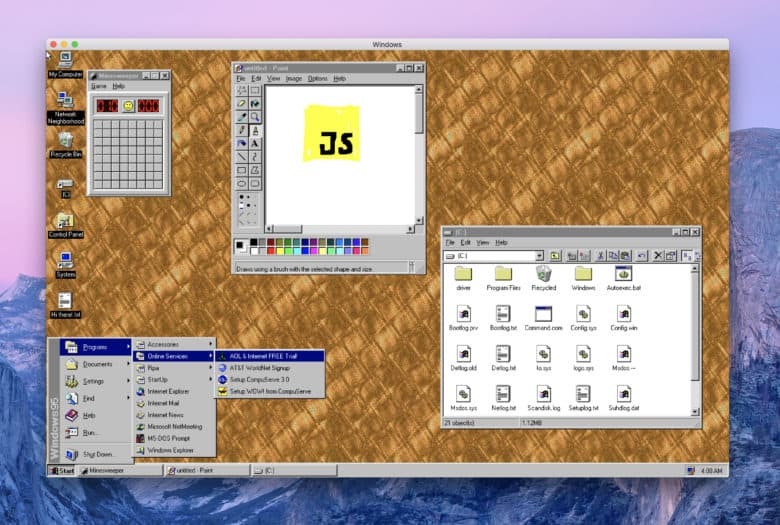 Rieseberg has put together an app that makes it easy to enjoy Windows 95 — and all the software that came with it — right on your desktop. It’s free and weighs in at just 129MB, and it requires very few system resources to run smoothly. The app lets you play around in applications like Wordpad or MS Paint, and play games like Minesweeper. It even comes with Internet Explorer, though you’ll find that it doesn’t really play nicely with today’s websites. All you need to do to relive the Windows 95 era is download the source code and installer from GitHub. Once it’s installed, it’ll run just like any other app. There’s no need to boot into another operating system, and no need for virtual machines.